Lockable Cash box and float – A mix or notes and coins I normally have a £10, 2 x £5, £10 of £1, and £5 mix of silver coins. Table cloth – Make sure it’s ironed! Neutral colour like white is ideal. Calculator – My maths is terrible so always handy. Lights – Better to bring too many than not enough, it was very dark where we were so had to bring in extra lighting. Extension Cable – Our plug socket was quite a way from the table so an extension cord was needed. Plasters – Something I wish I’d thought of when I managed to stab myself with a pair of scissors! Jewellery pliers and findings – If you’re a jeweller you may be asked to make some on the spot adjustments to necklace lengths etc. Phone and phone charger – Phone charger was another thing I wish I’d thought of, my battery failed to last the whole day, which luckily wasn’t a problem but it could have been. Lunch and a drink – You will be grateful you brought this! Pen, pencil, paper – Handy for taking customer details, or custom orders, also handy to make a note of sales to help with stock taking at the end of the day. Business cards/ promotional material – Bring loads! Phone number of the venue – Always handy if you get lost or stuck in traffic. Warm clothes – it may get chilly even if you are indoors, we were freezing at the weekend, so make sure you have a jumper or cardigan spare. Comfy shoes – it’s going to be a long day so wear something comfortable you could be on your feet a long time. Really corny but bring your smile! Leave any worries or woes behind, your customers don’t want to know about it. Overall craft fairs are really good fun, I always enjoy meeting new people, especially the other sellers some have some great tips and may even know of other fairs you could do, it’s also great seeing all the lovely handmade items. They are very tiring but rewarding, it’s always nice to see face to face people appreciating your work and wanting to purchase it. There will be slow times, which it’s why its good to bring a friend and/or some work, but it will give you to have a chance to have a look around yourself. Make sure you give yourself plenty of time to set up, even though I had a practice at home and had in my head what I wanted the table to look like, I changed my mind when I got there. It’s horrible to be rushed and you want to be sat down with a hot cup of tea for 5 minutes before the customers arrive. Under the table have your bags and packaging organised and your float un bagged and ready. 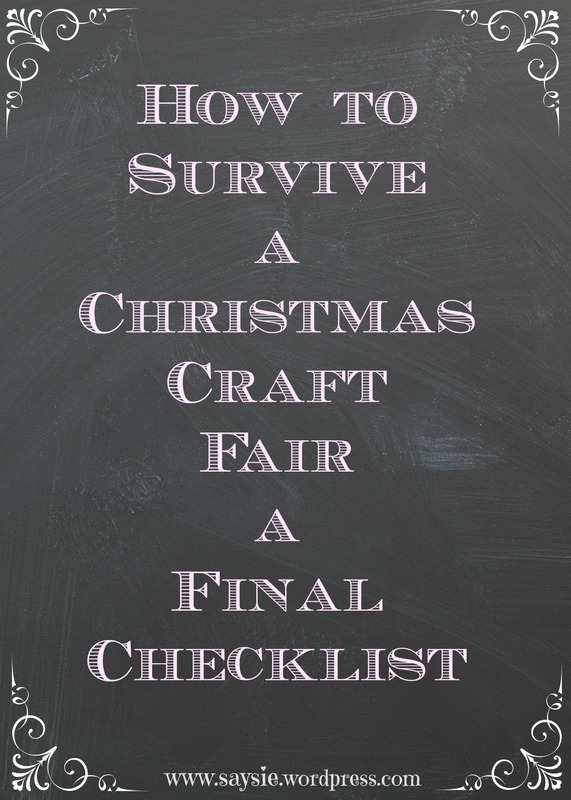 I wish you well on your fairs and hope this little guide has helped.